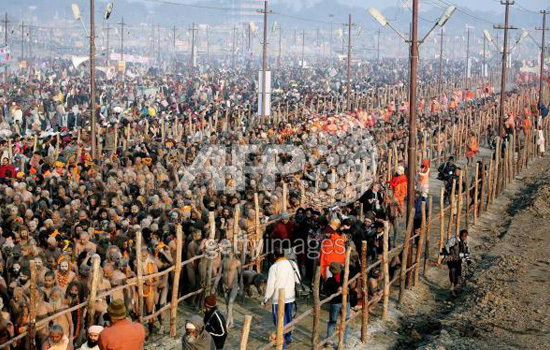 The last important bathing date of the half Kumbh Mela in Allahabad, India, is set for next Friday, February 16. 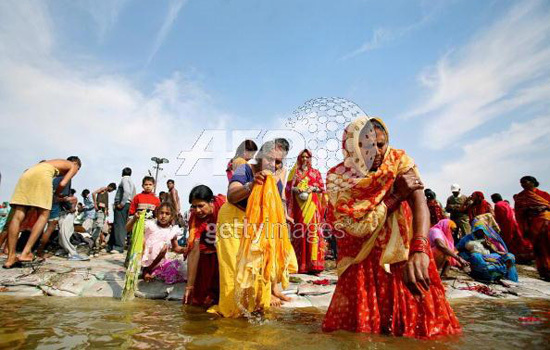 By some estimates about 60 million people will have participated by the festival's end, and as mindboggling as that number sounds, even more pilgrims are expected to attend the Maha Kumbh Mela in 2013. 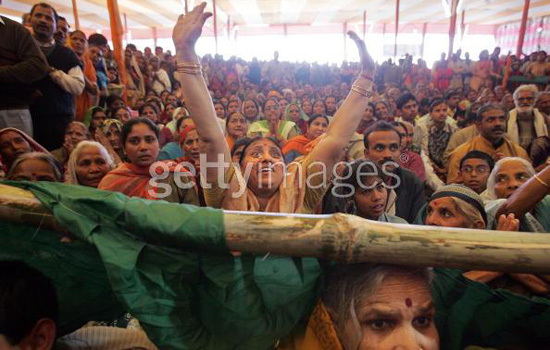 Here are some photos from Getty Images, which are copyrighted, hence the empathic branding. Nevertheless, the photos are still quite stunning. So: how much electricity can be generated from 60-70 million ecstatic people walking, parading, running, crossing pontoon bridges, or simply splashing about? How many kilowatts can a teeming mass of people, roughly equal to the population of France concentrated into an area the size of three Central Parks, produce? Say, for instance, a network of perambulatory channels is grafted onto Allahabad, the Ganges, and Yamuna, something resembling a High Italian Baroque fountain, or if one were to prefer something vernacular, a Mughal fountain, but in either case, unabashedly flamboyant in design and engineering, crazily interlooping, fractal, and stampede-proof. It's a water feature writ large. 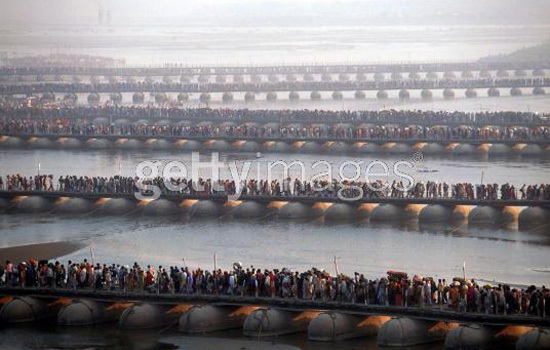 The Maha Kumbh Mela Fountain. And imagine then that these human aqueducts were somehow rigged to harness the kinetic energy of tens of millions flowing through them: would there be enough electricity produced to power the city for a couple of months? Or perhaps just to power a handful of emergency hospitals and aid stations? A dozen defibrillators? A couple of things: 1) We sort of like the image of ash-covered naga sadhus only going through certain channels, and women wearing brightly colored saris on other channels: the turmeric yellows over here and the vermillions over there. And petal-bedecked priests carried on floats by their technicolor-hued devotees each taking over a channel. But all are surging towards the water, coiling and recoiling, circling one another on their own separate paths, brushing up against each other, color against color, but without mixing. 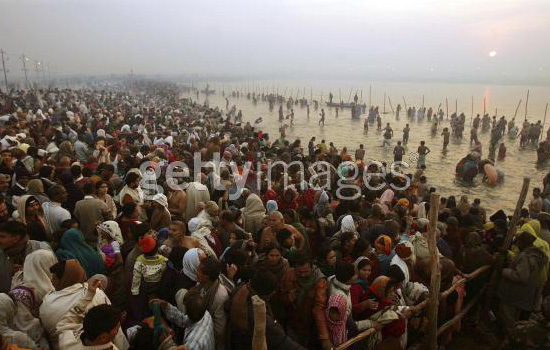 Until finally, they merge together into a single crowd in the holy rivers. And 2) while waiting for the next mela, you can probably rig pedestrian subway tunnels to generate electricity from the morning and afternoon rush hour traffic; from sports fans exiting sporting arenas; from the throng of New Year's Eve and Independence Day revelers as they scamper about urban squares, sidewalks, and plazas, if only to power nearby traffic signals and street lights. What is interesting about the Mela is that despite there being such a huge number of people gathered together in one space - over 60M - we never hear about any problems with crowd control, stampedes and deaths. Your recent post on the Jamarat Bridge demonstated that the same cannot be said for the Hajj which is requiring ever more inventive architectural solutions to the problem of mass gatherings. I wonder what can be concluded about each religion - hindu, islam - from this fact? Before you jump to any conclusions... 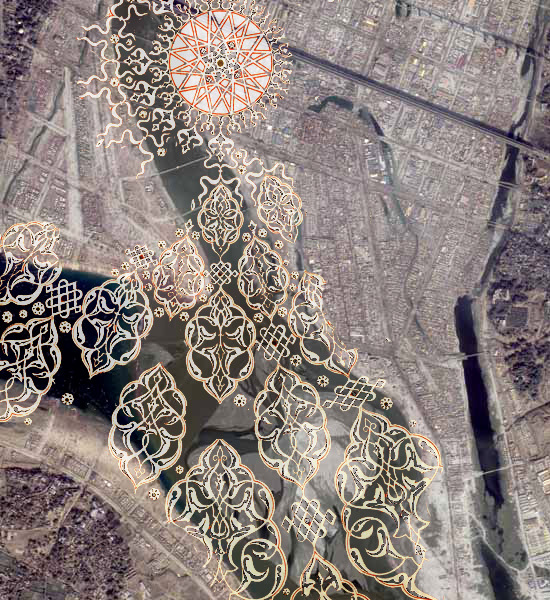 While the Mela is held at large spaces outside the city, the hajj occurs predominantly in built space(i.e. tunnels)once designed for smaller groups than the 4 million people who visit the Hajj. Which means that stampedes cuold be a result of poor design. Aslo you could examine how the process of the Hajj proceeds against porcess of the Mela (time, places to visit, type of procession, etc.). If some religious fanatic was to ever read your comments with regards to how much electricity can be generated from the next Kumbh mela. you will be spammed for hate mail like you have never experienced before.